Beautiful Mind was such an interesting drama that explored the morality of our decisions and the fine line between what makes someone human or a monster. We go on an emotional and moving journey with a group of people who are trying to find those answers. Jang Hyuk was phenomenal in the role of Young Oh and really brought to life such a complex character. But he wasn’t the only who gave a moving performance. The entire cast was amazing and really delivered intense and heartfelt performances. 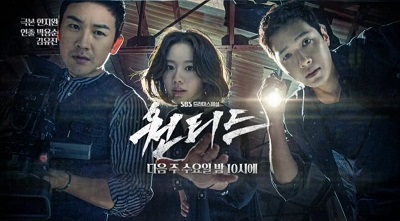 Let’s Fight Ghost was a cute and fun drama with a nice dose of scares and romance. It has a bit of an episodic feel to it, but this is a case where that didn’t bother me at all. That’s thanks to it being so cute and funny. And then the story really begins to take shape in the second half of the drama. Wanted was a decent watch. The pacing of the drama was pretty great during the first half of the drama with some nice cliff hangers thrown in. But there’s a point just after midway through where things seemed to slow down. It was also a bit lacking in really developing the characters and making them empathetic. The ending ties everything together pretty well while going very in depth with the kidnapper’s motives and taking a hard look at the morality of our choices. I enjoyed Queen In Hyun’s Man quite well. But I didn’t fall in love with it like most of dramaland. It had some issues for me including the story feeling slow and neither timeline feeling fully developed. But despite some issues, it really had a lot going for it and was a really great watch. Good Morning Call is my second completed Japanese drama. It’s a very simple drama that I found pretty average. The main couple was cute enough and provided a few laughs. But there wasn’t enough story to really keep me interested. So August was a pretty good month for me. Beautiful Mind, Let’s Fight Ghost, and Queen In Hyun’s were all fun in their own way. Wanted had a unique story, and I’m glad I was able to add another jdrama to my completed list. For the month of September, I hope to complete W-Two Worlds, Uncontrollably Fond, and White Christmas. So how was August for you? This entry was posted in Articles and tagged Beautiful Mind, Good Morning Call, Jang Hyuk, Ji Hyun Woo, kdrama, Kim So Hyun, Let's Fight Ghost, Queen In Hyun's Man, Taecyeon, Wanted, Yoo In Na. Bookmark the permalink. I haven’t watch the last episode of “Let’s Fight Ghost”, but I will later. Currently watching “Because It’s First Time”, “W”, and “Cinderella and the Four Knights”. Ooh, all of those are on my list! I’m going to start W here pretty soon and definitely Cinderella. Let’s Fight Ghost was really a lot of fun, and I’m sad it’s over. I was only able to finish Doctors in August, but it was a good one. Not the most impressive drama, but just good. It was supposed to be a healing drama, and I think it did deliver its goal. Of the ones I am currently watching I like W most. I will be sad when it ends. It’s been a while since I’ve watch a drama but I’m trying to get back into it. I think Jang Hyuk is amazing (one of my fave Kdramas is Thank You) so I think it’s only natural if I start with Beautiful Mind. Loving these updates by the way, great blog. How’d you feel about sharing your work on Moviepilot/Creators? I’d love to expand on that so feel free to send me an e-mail. My contact details are on my blog. Hope to hear from you. Beautiful Mind is definitely an interesting drama, and Jang Hyuk is truly wonderful in it. I loved Thank You too! Such an amazing drama 🙂 I’ll also take a look at the site and see if it would be something I would be interested in doing. That’s always the constant problem of a kdrama fan…never enough time to watch all the dramas, lol. You’ve got a really good group of them going right now though. I bet you’re happy! I’m about to start W and am soooo excited! Yes, I’m definitely happy with so many awesome K-dramas at once! Oh yeah, W is really awesome so far!